Who are the free spirits of Vilnius? Meet the creatives who call the Independent Republic of Užupis home. Covering less than one square kilometre, the Independent Republic of Užupis is a bohemian district similar to Freetown Christiania in Copenhagen. Literally meaning “beyond the river,” Užupis is separated from the Old Town of Vilnius by the Vilnele River. Neglected during the Soviet era, the derelict quarter received an imaginative makeover from artist-squatters who covered the façades with street art and declared Užupis a tongue-in-cheek republic in 1997. Twenty years later, the micro-republic has its own president, currency, navy (three rowboats at last count), and constitution, which features rare gems of legislation such as: Everyone has the right to love a cat. Tadas Trucilauskas laughingly concedes that he’s “a stereotypical Užupian” – free-thinking, fun-loving, creative to the core. 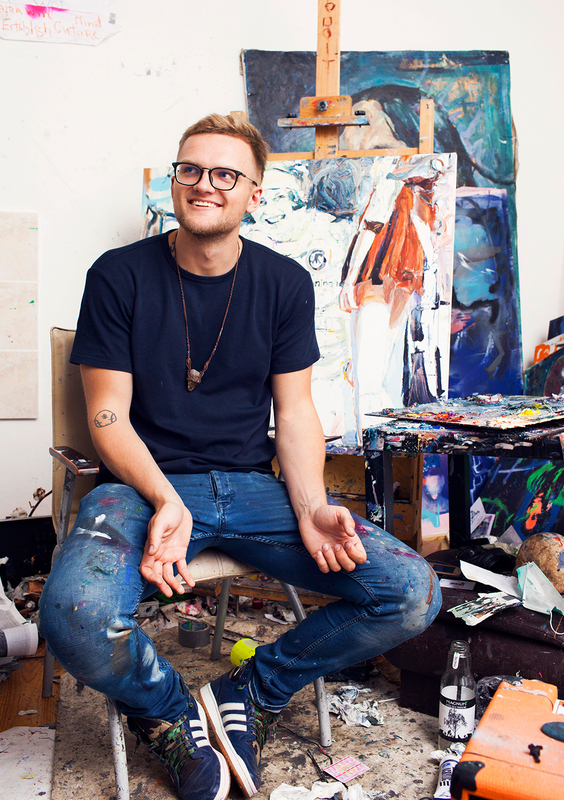 The Klaipeda-born painter is one of 17 artists in residency at the Užupis Art Incubator, a shared workspace and gallery dedicated to fostering creativity. Behind the red doors of the main building is the micro-nation’s “immigration office,” where visitors can have their passports stamped. “When you cross the river, you arrive in a new country,” says Trucilauskas with an amused smile. “Our parliament convenes at Užupio kavine, the riverside pub, every Monday at seven,” shares Trucilauskas. The winding cobblestone streets are lined with trendy bars and boutiques, yet the Lilliput nation has preserved its whimsical charm despite inevitable gentrification. “When I step outside my studio, I’m surrounded by medieval architecture and woodlands. And there’s always something surprising going on. I just saw the Dalai Lama walking down the street. He’s an honorary citizen,” he says. Down the hallway from Trucilauskas’ studio is the workroom of Vilija Kvieskaite, a graphic designer whose current main passion is illustrating children’s books. 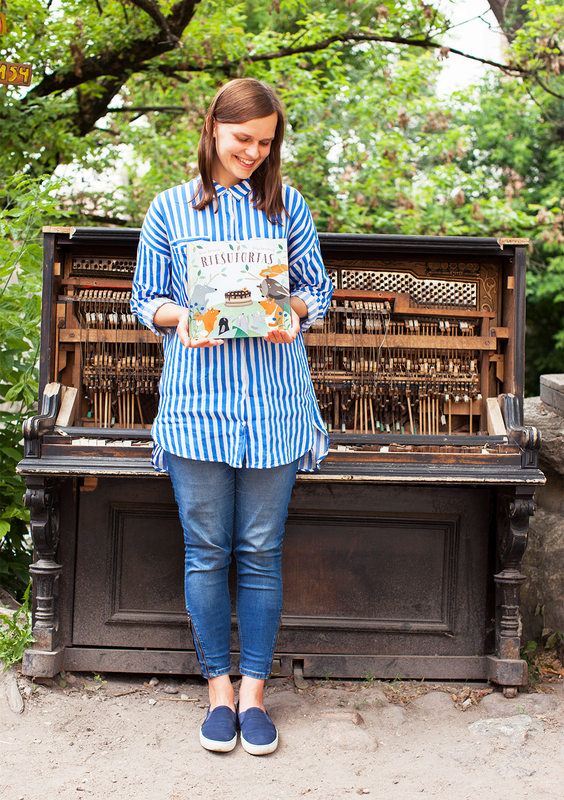 “After six years of working at a publishing house, I craved more creative freedom. I found it at the Užupis Art Incubator. Here you can do what you want, and no one judges you,” she says. Kvieskaite is often found sketching outdoors by the river, preferring “old-fashioned pen and paper” to digital technology, which she uses only for the final touches. “The riverside location is so inspiring. According to local legend, if you stare into the eyes of the mermaid statue by the river, you’ll never want to leave,” she recounts. Spontaneous cross-pollination of ideas is one of the many upsides of working in a close-knit creative community. “We sit by the river sharing ideas and inspiring each other. I’ve recently started collaborating with the ceramics studio downstairs – I’ve never worked with clay before, but now I’m hooked,” she says. The good-humoured spirit of Užupis is strengthened by the many pop-up events and festivities held throughout the year. Highlights include Užupis Day on April 1, when the republic celebrates its independence (coinciding, not by accident, with April Fools’ Day). On this day of music and revelry, visitors can have their passports stamped by uniformed patrolmen and enjoy a beer from the fountain in the main square. Erika Paule, creator of the erikahoc “slow fashion” brand, always allows extra time for every important appointment. Whenever she walks down to the main square, she can count on having to chat with at least five people along the way. “It’s hard to explain the vibe of this place. It’s warm, easy-going and open-minded. We’re creative people and we all know each other, like one big family,” muses Paule, who is one of 14 designers based at the Kalnas Design Hub, an EU-funded venture run by the Užupis Art Incubator. The hub sits on a leafy hilltop in an ascetic wooden building that blends attractively with the historic surroundings. The clean lines of her sun-filled studio reflect the timeless look of her minimalistic black leather accessories. “I try to reduce extraneous detail and create a constructed appearance for my designs. And every item is 100 per cent hand-made in Lithuania,” she says. The Kalnas Design Hub hosts a mix of fresh startups and established designers, offering a balance of independence and creative synergy. 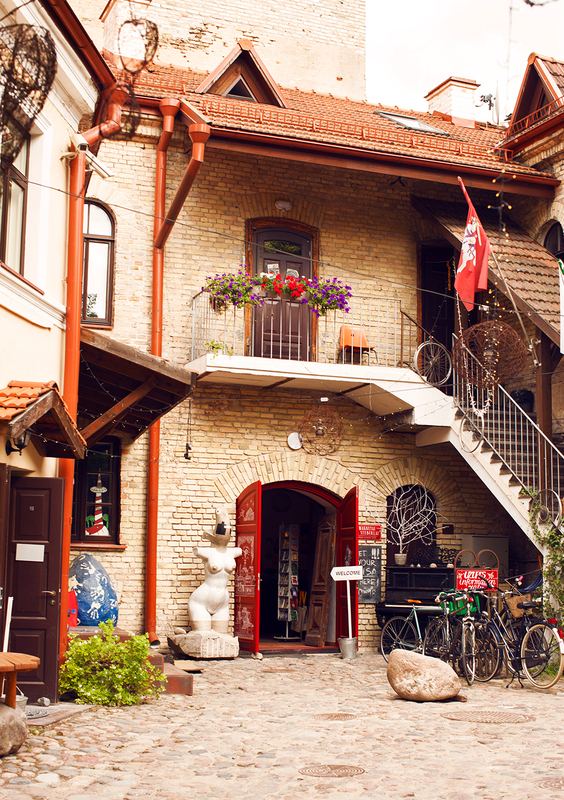 With rents rising and Užupis rapidly becoming one of the priciest districts in Vilnius, Paule hopes the quirky micro-republic will retain its fierce independence and stave off the invasion of shopping malls and bland internet cafés.